Admittedly, it lacks the original’s kinjal shape and curved blade. We once had a double-edged, serrated kitchen knife and I swore a mighty oath on the bones of my ancestors to never, ever make that mistake again. 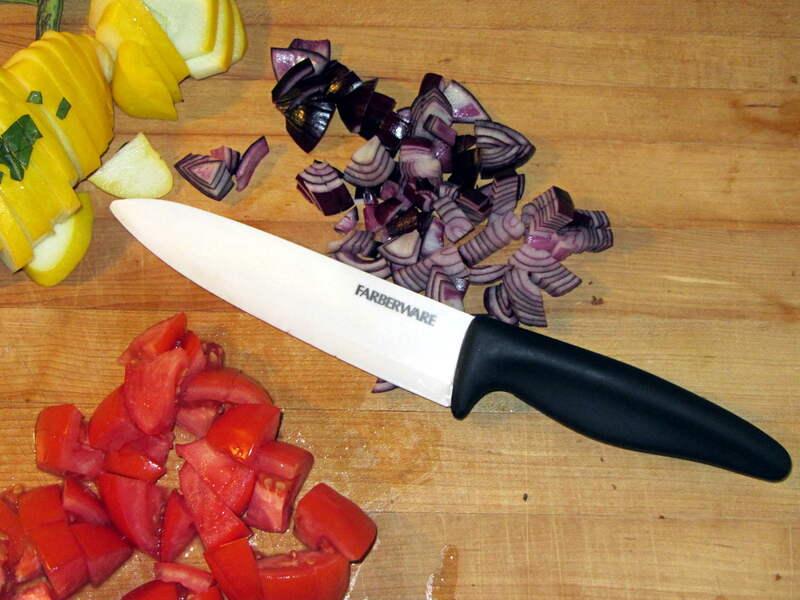 Surprisingly, the plastic handle balances well with the ceramic blade: no need for another tungsten counterweight. The handle extends slightly below the blade’s heel, which may call for some abrasive adjustment. The blade is slightly thicker than the wonderful steel santoku knives we’ve been using forever and doesn’t taper uniformly from spine to edge, so it’s no good for constrained cutting (like quartering an apple). The hollow-ground section behind the edge forms a wedge that cracks apples apart, unlike the santoku’s full-width taper that just slides right through. I was mildly surprised to find that it’s no sharper (perhaps that’s “no more keen”) than our steel knives, but, then, I’m wicked with the sharpening steel. The edge arrived minus a few tiny chips and I suspect we’ll add more in normal use, right up to the moment when one of us drops it on the floor. A gotcha: that blade’s eyeblink affordance is harmless plastic. I must remind myself it’s a real knife with a lethally sharp edge.